So I’m fondling my new High Standard 357 AMP, and I am distressed to learn that the magazine won’t hold the bolt open, even with the grips removed (I know some aftermarket grips can interfere with that function). I have four original mags, two new production NOS mags I got from Tim Bell, and two Triple K mags, and only one of them works, most of the time. It’s an original one where it looks like somebody pounded on the head of the pin, mushrooming and slightly enlarging it. 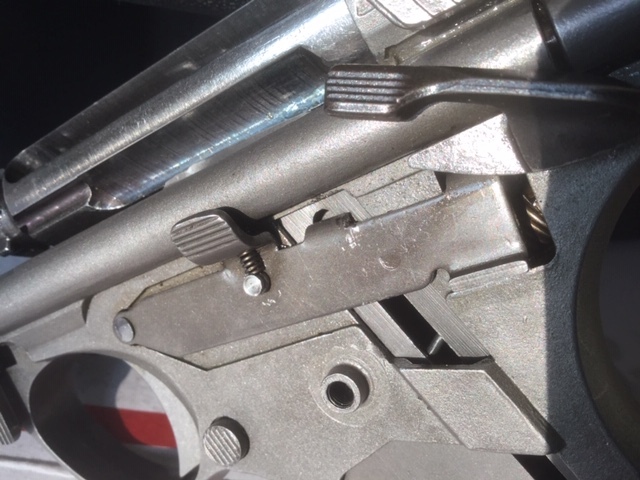 Manually locking the bolt back works fine. Looking inside the magazine well at the inside of the bolt hold-open, I can see visible signs of wear, where the magazine pin engages it. On my other Auto Mag, the engagement surface is completely flat. On this one, there is a visible curvature to it, and material has been worn away. The question is, what should I do to fix it? 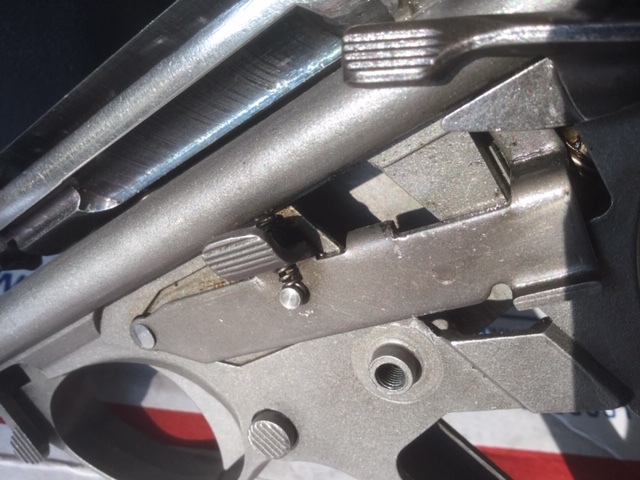 I have access from the outside, and it seems as though if I squeezed it carefully and bent it downwards somewhat, it would lower the contact point and enable the magazine pin to have fuller engagement, but I am reluctant to start mangling things. I suppose I could probably buy a replacement mag hold-open and have it installed by a gunsmith (I’m assuming this job would not have 1911-levels of simplicity). Who else has experience in such matters, and what advice do you have? I look forward to words of wisdom. Thanks! the first thing I always do is try a different magazine. I have a lot of mags and I usually find one that works. Once I find one that works I compare the two and see what is the difference. It usually means that the pin on the mag needs to be sticking farther out of the mag amd it can be adjusted. Thanks, but I did that. I tried all eight magazines, and it only worked (sometimes) with one of them, the one whose pin is deformed so it is slightly larger in diameter. The problem is definitely the bolt hold-open, which is visibly deformed. It’s easy to see but probably impossible to photograph. I think I may be able to get it to work by bending it, but I am reluctant to try that without first hearing from others who have done so successfully. I suppose I have little to lose by trying, as it doesn’t work now, and really should just be replaced. I assume that it is part #34 that you need. I tried to look it up and see what they are charging and the New Auto Mag does not list it but Crazy Brian has it at $97.00. I'd try to straighten it, like you say, nothing to lose. Here's a thought take the old one out, photo it, re- shape it and try it. If it breaks or just won't work drop a line to " new AutoMag" and see what cost is( I would do this even if it worked as it might go back to bad again). You'll need to replaced the retaining ring once you remove that piece. They aren't easily removed (or installed without an installer). I'd take it out of the gun. If it's that worn, you could probably have someone tig weld that spot up and then grind it back flat, what I would do as it's stainless. And Beemer is spot on, you really can't go swapping mags around in Automags, they are picky. I came home early from work in an attempt to resolve the situation. I hoped to be able to deal with the situation without dismantling anything. I hit upon the idea of using needle-nose vice-grips as a squeezing tool. That proved to be a failure. As it turns out, Auto Mags (and their various components) are HARD things! I believe the pliers were bending rather than the part. Here are three pics. The first shows the gun with the bolt forward, magazine removed. The small spring under the thumb lever is pushing the holdopen downwards. 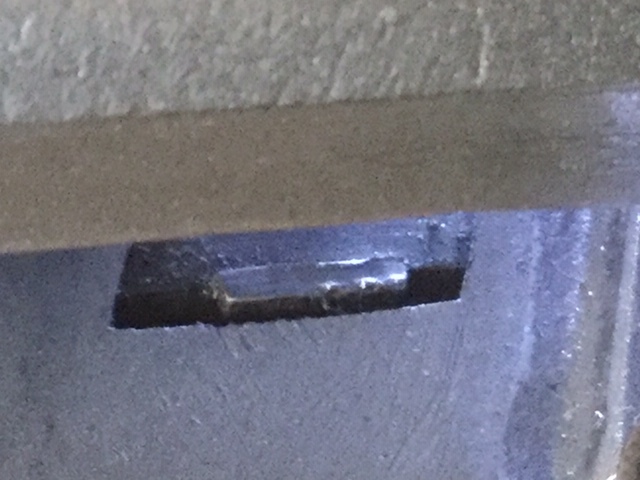 The follower pin is pushing the holdopen upwards, limited by the fact that the magazine follower is pressed downwards because the bolt holdopen is prevented from moving further upwards by the underside of the bolt. Note that the magazine spring is slightly compressed because of this. Unfortunately I still can’t get this to occur naturally. 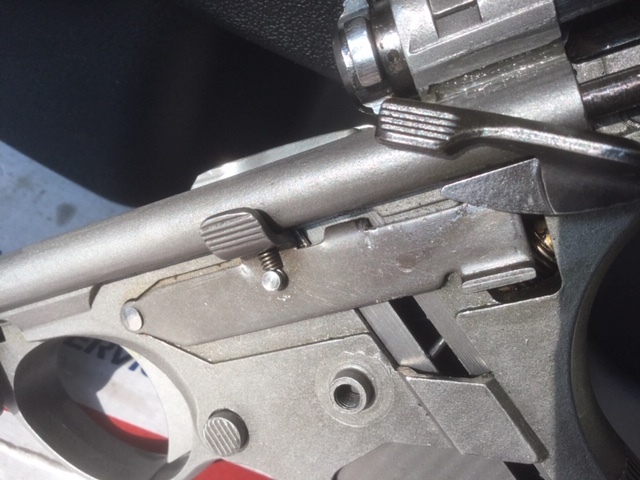 I note that the small spring under the thumb lever is very strong, and is pushing the holdopen lever down even as the magazine spring is pushing it up. I get the sense that this spring is just winning the fight, and can’t be overcome even by brand new magazines with new springs. While horsing around with all of this, I was horrified when the trigger plate (part #32) went ‘clink’ and fell onto the table! The washer was lying alongside, but the super-special tiny snap ring #30 was nowhere to be found. A panicked search ensued and by good fortune I found it a few minutes later, and then successfully wrestled it back together. I believe I dislodged it when my vice-grips slipped once (which also lightly scarred the holdopen as can been seen in the pics). Good photos but I would like to see inside the mag well of the nub that gets caught on the mag pin to move it up. Is it really that short? Bent outward? Pin worn? Doesn't look to hard to remove lever and vice fix it if bent. Worn, would need to add, maybe weld up to bring to fit right then grind flat and straight. Does anybody know if it's just steel or is it SS? In this view, the gun is lying on the right side, front of the gun facing the left. The bottom of the magazine well is towards the top of the photo, and the front of the bolt is to the right. In the photo, the mangling at the top is how it came to me, damaged by the magazine pins. The damage at the bottom (which is the top of the part) was caused by the vice grips today. I had padded the jaws with heat shrink, and failed to note that one of them lost the heat shrink just as I clamped down on it. I’m unclear if the damage to the holdopen where the magazine pin engages it is really the source of the problem, or if the problem lies elsewhere. Are you saying the safety plate fell off? That's not good. That retaining ring is shot. You can buy new ones. I may have some left, but I was running low last time someone bought some. I do have parkerized ones still too I think. I have an old ad over in the Classifieds. That means the safety lever is loose too. You can never get those retaining rings back on to stay tight once removed. You'll probably loose it while shooting the gun sometime. I can send you the article I wrote on how to make an installation tool from the lisle center punch. You can get it on Amazon-Lisle 30280 Automatic Center Punch. You'll need a Dremel to cut the part, and vise to hold it (at least safely). Obviously working any gun yourself is at your own risk. There's a lot of things going on with an Automag. Not sure who works on them anymore.